Jewish Home party: talk of ministries is ‘irrelevant’ – and offers should not include ultimatums. 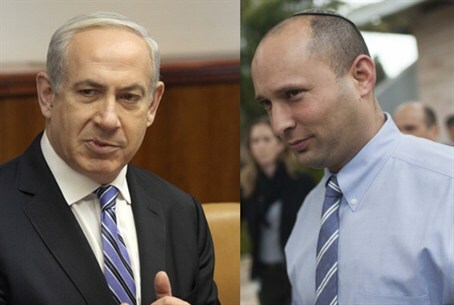 Sources in the Bayit Yehudi (Jewish Home) party said Wednesday evening that the party will reject an offer from Likud Beytenu that included a promise of top ministerial slots. Likud Beytenu reportedly offered the Jewish Home the Education Ministry, the Ministry of Religious Affairs, a senior finance-related position and the position of Deputy Minister of Defense. In exchange Likud leaders demanded the party’s signed agreement, within 48 hours, to join a Likud-led coalition. “We got the offer from the Likud today – more than 20 hours after we heard about it in the media,” sources in the Jewish Home party said. Likud’s latest offer is “unacceptable and irrelevant” they declared. “Only after we agree on basic principles and on positions on key issues can we turn to discussing political positions and ministries,” they explained. “And even then, it would be better not to approach us via the media, and certainly not to give an ultimatum,” they added.